Today was a beautiful, brisk, fall day. The boys were getting a little restless so I decided we'd grab the camera and go mushroom hunting. There are so many funky looking fungi around. Taking pictures is a great way to "bring home" your finds and try identifying them. 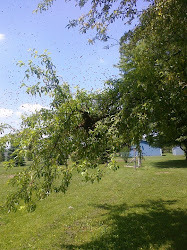 The boys love to learn and of coarse LOVE to take pictures. 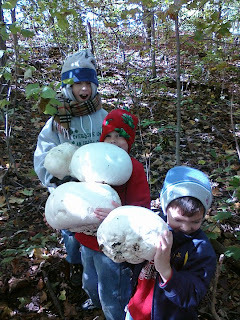 We found Boletes, Drysdale Saddles, Slippery Jacks, Turkey Tails, and all kinds of little puff balls. They thought it was so cool when you poke them and the "smoke" comes out. 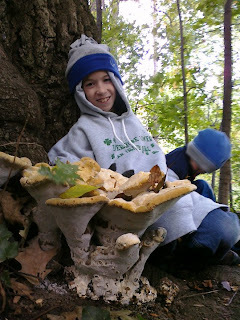 My oldest son, Xander, found some new mushrooms and starting calling for the camera. We were struggling to get to him. I grabbed Trevor and Seth because we had to find a way around all the poison ivy between us and Xander. On our way around we found some GIANT PUFFBALLS. I called for Xander and he was AMAZED! 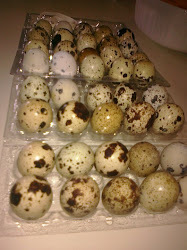 We harvested 8 of them! I've been hunting for recipes and think I may have a couple winners. We'll see!!!! Cut one end off the puffball and scrap the inside, carefully. Chop up the scrapings. Mix all the ingredients together with the scrappings and stuff the mixture back into the puffball. Cover the puffball with the cut end and wrap it in foil. Place in a roasting tray. Place the stuffed puffball mushroom in the oven at 180 degrees and bake for about 2 hours. Slice and serve with vegetables. 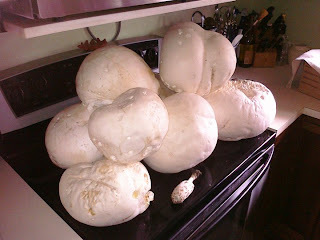 Wash the giant puffball mushroom. Remove the outer leathery skin-like layer. Cut it into slices. Use 2 slices for the recipe. Freeze or dehydrate the rest of the slices. Brush olive oil on both sides of each slice and place the slices on your gas grill. Grill the slices till you can see the grill marks. Check to see if they are crisp on both sides. Spread a small tomato pizza sauce (pesto sauce can be used) on your pizza. Place all the desired toppings on your pizza with shredded cheese and mushroom slices. The oven should be preheated to 400 degrees. Place the pizza in the oven to bake. The cooking time depends on the number of toppings put. Cut the mushroom into thin strips after peeling off the outer skin. Chop onion and garlic and lightly fry it in olive oil. Add puffball mushroom strips and risotto rice. Fry for another 2-4 minutes. Add white wine. Once the wine is absorbed, add stock and seasonings. Simmer the heat and cook it for 20 minutes. In a separate frying pan, gently fry asparagus in butter. Sprinkle the fried asparagus with parmesan and serve it with risotto rice. Heat oil and melt butter in a pan. Fry diced onions, jalapeno, mushrooms and potatoes. Cook till the onions are transculent and the potatoes slightly brown. Add the chopped garlic. In a separate dish, add flour and milk and stir to make a slurry. Add the slurry to the pan. Add wine, salt and ground pepper. Cook it till the potatoes are fork tender. Add cream. 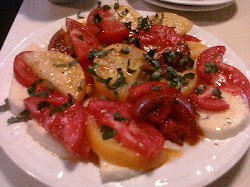 Garnish the dish with chives when you serve. thats awesome! Ive always wanted to know how to pic mushrooms, so afraid ill be poisoned. Those are huge!